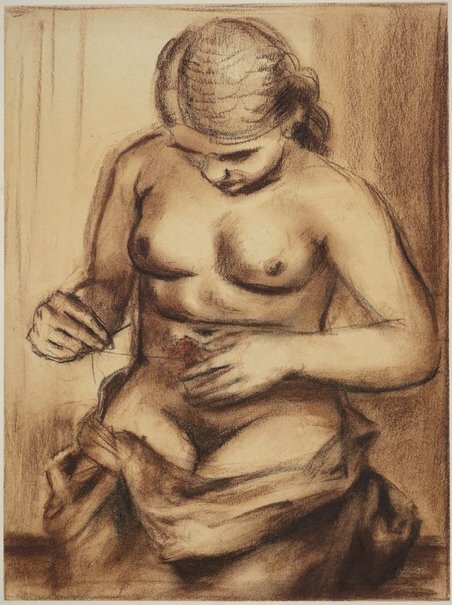 The figure in this drawing is embroidering her abdomen with a flower. Gleeson developed this further in the painting 'Primavera' in which the figure of Spring, enveloped by branches, has an embroidered torso. There are three additional studies for 'Primavera' in the AGNSW collection. Hendrik Kolenberg and Anne Ryan, 'James Gleeson: drawings for paintings', Art Gallery of New South Wales, 2003, pg. 53. Hendrik Kolenberg, Look , 'Revealing drawings: ideas that were turned into monumenal paintings', pg. 22-26, Sydney, Mar 2003, 25 (colour illus. ).